So what’s going on here? ShapeOne and ShapeTwo should have the same areas, because both equal to the sum of areas of Red, Green, Yellow, and Lime. But if you count the squares of each, ShapeTwo is one square less than ShapeOne, marked by (?) mark! Is ShapeOne = ShapeTwo? Or is ShapeOne one square bigger than ShapeTwo? So, ShapeOne = ShapeTwo, ShapeOne and ShapeTwo are the same. 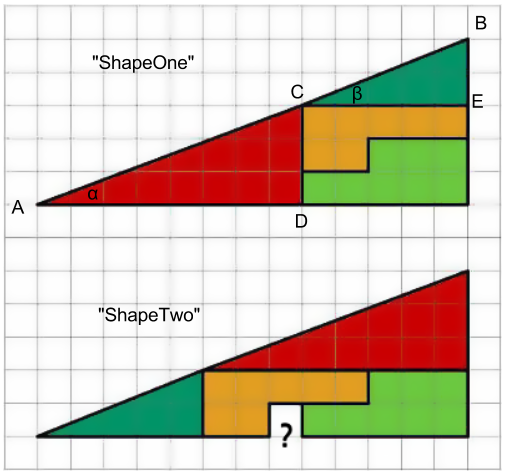 So, ShapeOne’ > ShapeTwo’, ShapeOne is one square bigger than ShapeTwo, which is the missing ?-marked square. So here is the contradiction: the two methods do not agree on our question of the relationship of ShapeOne and ShapeTwo. Which one is correct? So which method has the right number? Could it be our beloved trigonometry wrong? Well, actually Method 2 assumed the wrong thing, so of course it gave the wrong result. Our eyes fool our brain. In fact, as I’m going to show soon, that ShapeOne is not a right triangle, and ShapeTwo is not a right triangle with a ?-marked square subtracted off. So we can’t actually run Method 2 with the assumption that both shapes are right triangles–How could we run triangular formula on non-triangles? So the only safe and right method to use is method 1, which only assumes the shape is irregular. Is edge ACB really a straight line? If it’s not, then it follows that ShapeOne is not a right triangle. ACB is straight line only if angle α = angle β, which holds only if CD / AD = BE / CE. But CD / AD = 3 / 8 = 0.375, BE / CE = 2 / 5= 0.4. So CD / AD ≠ BE / CE. So angle α ≠ angle β. So edge ACB is not a straight line. So ShapeOne is not a right triangle. Similarly, ShapeTwo is not a right triangle with the ?-marked square added. So in summary, don’t trust your eyes, and assume the wrong things that ShapeOne and ShapeTwo (with ?-marked square) are right triangles and so use your beloved triangle formula. Instead, always be safe and break down the big shape to small shapes that are safe to assume to be fundamental types (triangles, squares, etc) and sum them up.